The Necromanteion (originally Nekyomanteion from nekys, meaning the dead) of Acheron was the most ancient and most renowned temple of necromancy in Greek antiquity. 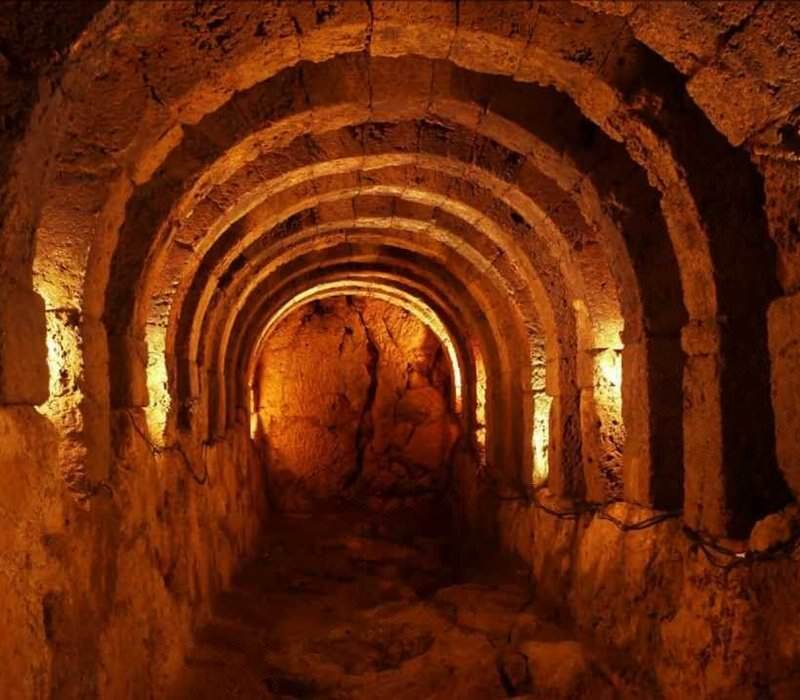 The ancients believed that it was located on the gates to the underworld, which led to the Kingdom of Hades, the god of the underworld who ascended to the world of the living only to abduct the beautiful Persephone. Charon, the ferryman of Hades, carried the souls of the recently departed across the Acheron River to the entrance of the underworld, but he had to receive a coin (the ancient obol) in payment – hence, paying the ferryman. Just 8 km north of Preveza, in a lush green landscape covering 900 hectares lies Nikopolis, which was established after the momentous naval battle that took place at Actium on September 2, 31 BC. The archaeological site is located at the entrance to the city of Preveza on the Preveza – Ioannina national road; on the edge of the site stands the Archeological Museum of Nikopolis, which houses important finds and relics. Cassope (or Kassope) is located on a magnificent and secluded site, on a high plateau overlooking the sea, the Ambracian Gulf and the fertile lands to the south. To the north, the slopes of Mount Zalongo offer a majestic backdrop. The city was founded in the first half of the 4th century BC as the capital of the Kassopaeans. The city’s ruins are full of remarkable monuments that dominate the plateau. The Acheron River traverses 64 km through the region of Epirus and flows into the Ionian Sea. The river is the source and sustaining force of a wide range of ecosystems along its path, which are home to many species of plants and animals. It is an amazing destination for a walking excursion; visitors can admire the unique natural landscapes surrounding the river and swim in its waters. The Ambracian Gulf is one of the largest enclosed gulfs in Greece, with just a 700m opening connecting it to the Ionian Sea. The gulf is quite shallow and its shoreline is interspersed by numerous marshes, large parts of which form an estuary system with unique flora and fauna. It is listed as a wetland of international importance, protected under the Ramsar Treaty. In the gulf’s seven main lagoons, approximately 280 species of birds have been recorded – it is a heaven for bird watchers and visitors who enjoy unspoiled natural landscapes. Parga is a renowned seaside town and hugely popular holiday destination. It is built amphitheatrically on a steep slope nestled in a small, picturesque bay, where the small wooded island of Panagia stands in the shadow of the town’s imposing Venetian castle. Take a stroll up to the old town to view unique examples of the local architecture; wonder around the traditional cobblestoned streets through pretty stone arches to discover neighborhoods blooming with flowers in the gardens of picturesque little houses and colorful mansions. These two tiny islands have been known to entice visitors from all over the world with their emerald beauty and unique charm. True gems in the Ionian Sea, with beaches of unparalleled beauty: white sand or soft rounded pebbles lapped by crystal-clear waters that glitter in the sun. The islands are covered in groves upon groves of ancient olive trees, dense vineyards and untamed nature spilling all the way down to the seashore. There are daily cruises from Parga to Paxi and Antipaxoi. 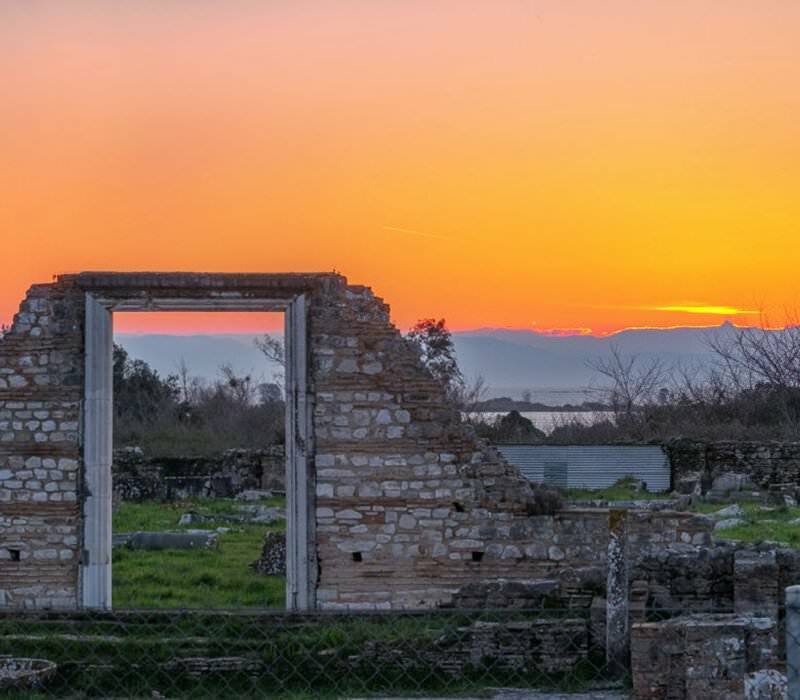 The city of Preveza sits on a strip of land between two imposing bodies of water – the Ionian Sea and the Ambracian Gulf, site of important events in antiquity. Preveza will charm you with its lovely pier and yacht-filled marina, dozens of waterfront restaurants and meze bars, pedestrianized center and stylish shops. Just outside town you’ll encounter Augustus, Anthony and Cleopatra at ancient Nikopolis. Once you’ve had your fill of culture, there are some 60 km of beaches to explore in this corner of Epirus, from Preveza to Parga. Long, sandy beach with 3km of coastline, with clear, deep waters surrounded by a verdant green landscape, Valtos is considered one of the best beaches in Greece. The beach is well organized and offers a variety of facilities and services, including beach bars and water sports establishments. The central beach in the town of Parga, it faces the small island of Panagia and other rock outcrops in the bay, which you can visit by rental boat. It is well organized and offers a spectacular view of the imposing Castle of Parga. Located on a small enclosed bay with crystal clear waters, the beach has small pebbles and is surrounded by a rocky landscape. It is near the archaeological site of the Necromanteion. One of the most spectacular beaches around the town of Sivota, it connects the mainland with the small island of Mourtemeno. It can be accessed both by land and by sea. Parga is one of the most popular holiday destinations in Greece, because it combines the picturesque beauty and laid-back ambiance of being on an island with the ease of access of the mainland. You can reach Parga Beach Resort in several different ways. There are five airports within a 400km radius from the resort, three of them international, and all of them serving either direct or connecting flights from all major European cities. We can help arrange your transportation from the airport that is most convenient to you to our hotel. If you enjoy travelling by boat, you can reach us by the ferry routes that connect several Italian ports with the port of Igoumenitsa. And of course you can drive here, since the resort is conveniently located close to the exits of major national highways. Click on our interactive map for more details. Aktion National Airport (PVK) is 65 km from Parga. In the summer months, it serves flights from several large European cities. There is taxi and bus service to Parga available from the airport or you can rent a car. Ioannina National Airport “King Pyrrhus” (IOA) is 100 km from Parga. There are flight connections to Athens International Airport. Corfu International Airport “Ioannis Kapodistrias” (CFU), located on the island of Corfu, is an hour and a half from the port of Igoumenitsa by boat. From there, you can reach Parga by road (45 km). The airport serves flights from all over the world. Athens International Airport “Eleftherios Venizelos” (ATH) is 410 km from Parga. It serves flights from all over the world. Thessaloniki International Airport “Macedonia” (SKG) is 340 km from Parga. It serves flights from all over the world. The port of Igoumenitsa is 45 km from Parga. The port serves ferry routes to the island of Corfu and to Ancona, Venice, Bari and Brindisi in Italy. The Egnatia Motorway crosses all of northern Greece, from the Turkish border in the East to the port of Igoumenitsa in the West. It also links to all the northern Greek border crossings. Take the “Vasiliko” exit off the Egnatia Motorway; from there, Parga is 33 km. Parga Beach Resort is ideally located on Valtos Beach, a short walk from the picturesque town of Parga, and at close distance to many visit-worthy destinations, spectacular beaches, monumental archaeological sites, and areas of singular natural beauty. Start by visiting Parga, one of the most popular holiday destinations in Greece; the lovely coastal city of Preveza; or take a boat ride to the enchanting emerald islands of Paxi and Antipaxoi. Indulge yourself by swimming, sunbathing and relaxing on any one of the area’s exceptional beaches, starting with Valtos, of course, and also Krioneri and Alonaki nearby, and then on to Bella Vraka, one of many great options around the town of Sivota. In addition to crystal-clear waters, golden sand or soft rounded pebbles, the area’s beaches also offer well-organized facilities and in many cases there are water sports activities available. 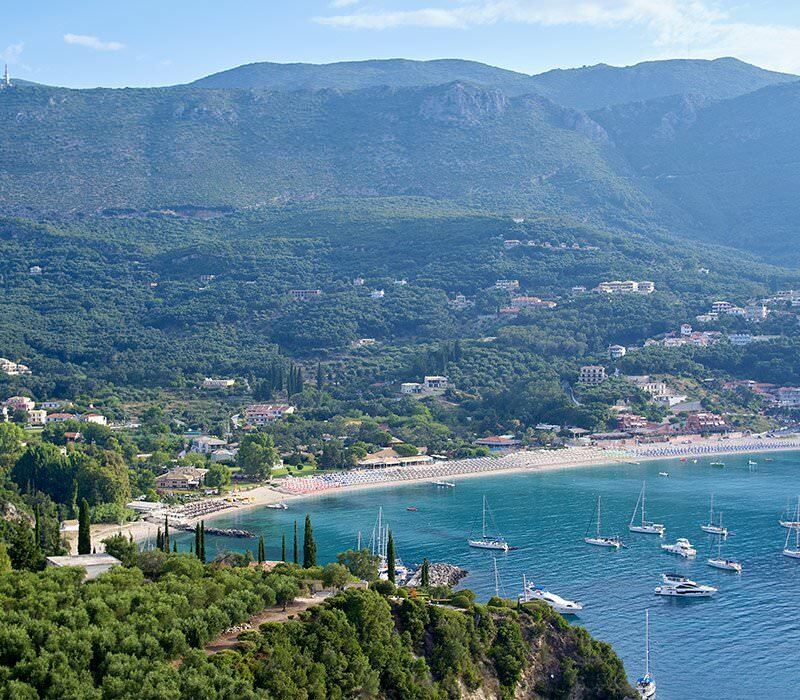 Explore the area’s rich history by visiting the Necromanteion of Acheron and the ruins of the ancient cities of Nikopolis and Cassope, and take in unique natural landscapes with excursions to the Acheron River and the Ambracian Gulf, both of which are home to one-of-a-kind natural ecosystems. 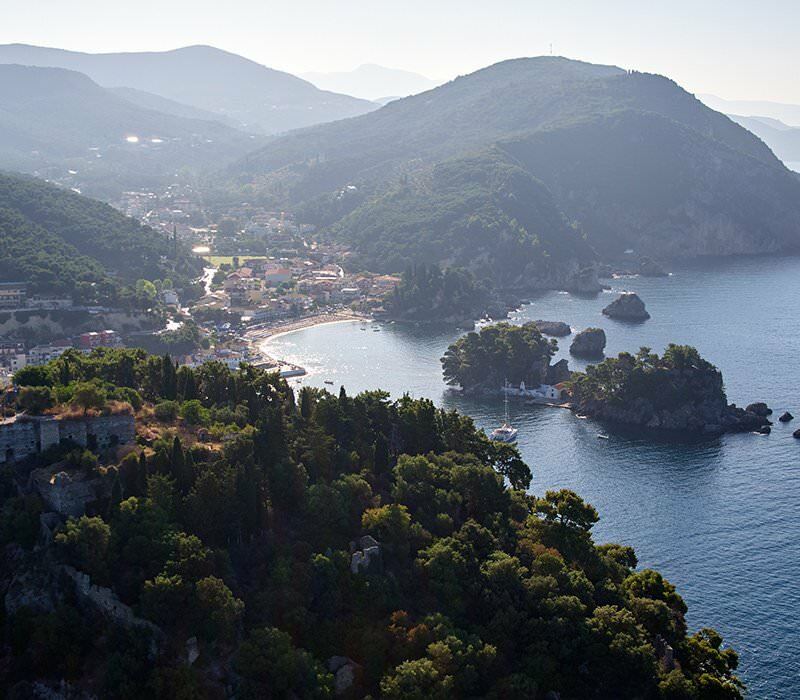 With Parga Beach Resort as your home base, you can discover the many hidden beauties of Greece’s Ionian coast. Click on our interactive map for more details.